LAPD officers Joe Cirrito and Kristina Tudor start a 400-mile run on Sunday, Nov. 27, 2016, as an effort to raise money for the families of fallen officers. 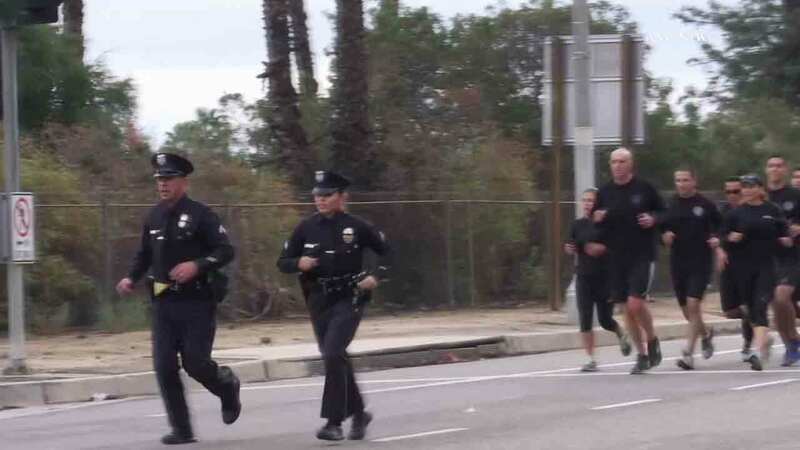 LOS ANGELES -- Two Los Angeles police officers on Sunday set foot on a 400-mile run in full uniform -- all to raise money for the families of fallen law enforcement officers. Officers Joe Cirrito and Kristina Tudor left the L.A. Police Academy for Sacramento. The 12-day run will take them to the California Peace Officer's Memorial. Along the way, they're raising money for the Los Angeles Police Memorial Foundation and the group, Concerns of Police Survivors, also knowns as C.O.P.S. "It's probably going to be a very vulnerable time but also a time to remember. It's going to be an epic journey," Tudor said. The two officers are completing the run during their off-duty days, and they'll be assisted by a team of some 40 volunteers along the way.